We were first contacted to put forward a proposal to brighten the appearance of the multi-storey car park and clearly define driving and parking areas as well as walk ways detailing routes and access to the shops. The Cheshire Oaks shopping centre is one of the busiest in the UK and the biggest challenge involved in this project was timescales. We only had a timeframe from 8pm to 6am each night to fully refurbish a section of the car park. The total space was circa 6,500m2 and was divided into 7 areas. We actually suggested 10 but managed to condense the program on site. The existing surface consisted of old tarmac and white lines and looked very tired. There were areas of damage where old bollards had been removed that required patch repairs. 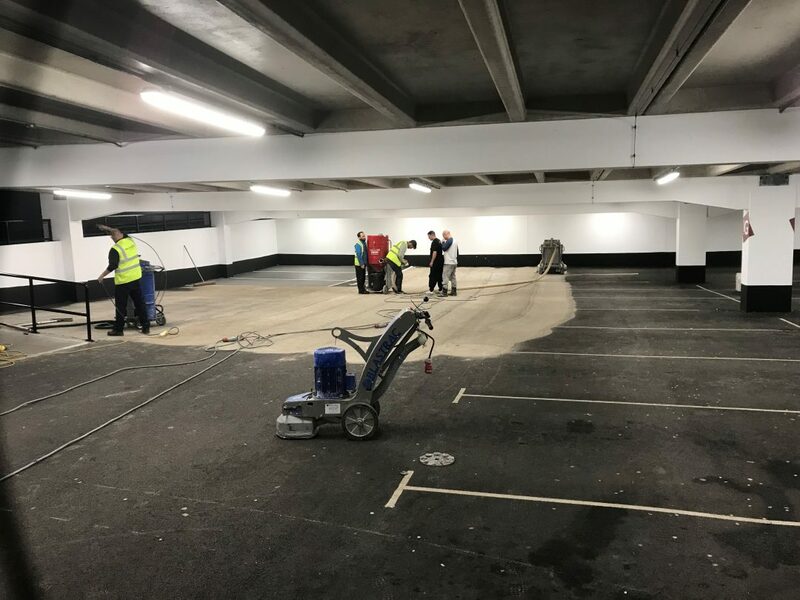 Each night before we could even commence laying the new system the tarmac had to be heavily mechanically prepared by diamond grinding the substrate to remove all existing thermoplastic lines and to provide a clean and profiled surface. We employed the use of our Scanmaskin 1000 remote controlled grinding machine alongside two Blastrac BG250 grinders. Each section of floor was then extensively vacuumed to removed any engrained dust. 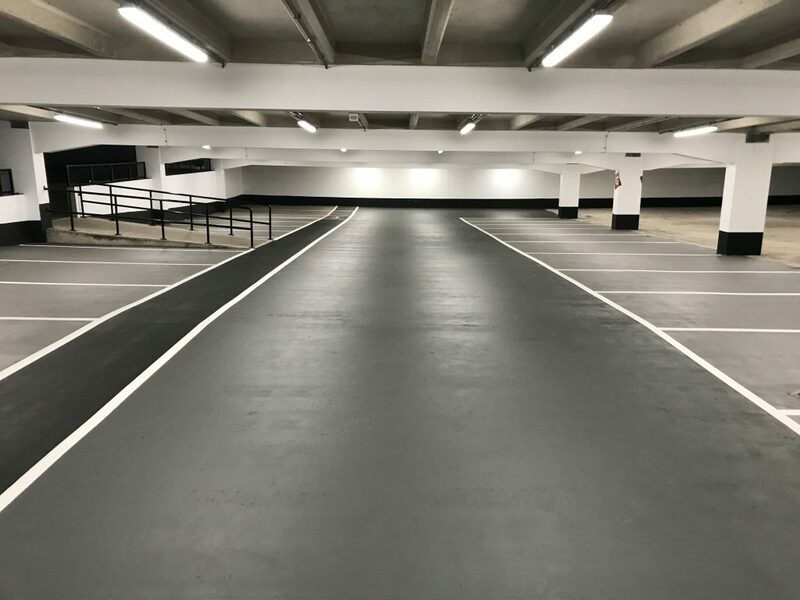 We opted to use the Tremco HFS internal car park surfacing system. The quick drying nature of the system allowed us to install all the layers every night, colour code the zones and reinstate lines and markings every night. We were complete for 6am daily allowing the car park to re-open at 8am and drive onto the new floors. The turnaround each night was remarkable and the new appearance really provides exactly what was requested. We are looking forward to commencing the upper levels next.